This luxurious fully air conditioned and centrally heated 2 bed, 2 bath apartment, sleeping up to 5 people is situated on the Tee 6 complex within the gated community of Los Flamingos. Finished in January 2008, it has been furnished with no expense spared. 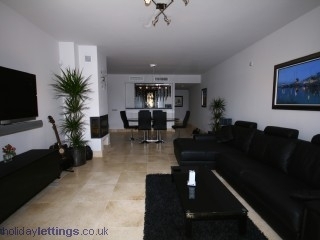 The property has Satellite TV with Sports & Movie channels included. Los Flamingos boasts 3 superb 18 hole par 72 golf courses and one 9 hole course which have been carefully designed by Antonio Garcia Garrido, it has played host for The Daily Telegraph European Seniors Match Play Championship and other major events. The course also boasts a superb 5 star hotel, the Ritz Carlton Villa Padierna with outstanding restaurants, Spa, Gym and tennis courts. 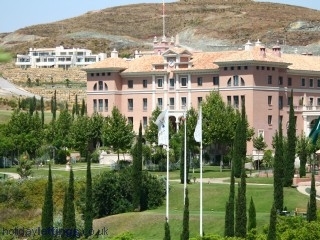 Full details of the hotel facilities can be found at http://www.ritzcarlton.com/en/Properties/VillaPadierna/Default.htm. A driving range and Club House complete the package. The world renowned resort of Puerto Banus is some 5 miles away with it's luxurious marina, restaurants, bars and designer shopping. For a luxury boutique beach bar experience, visit www.buddhabeachbanus.com, for full details of the facilities you can enjoy with them. 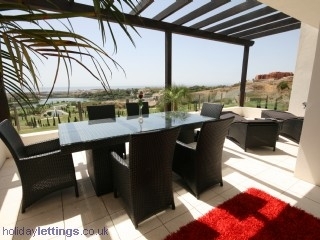 Alternatively, Laguna Village also offers excellent facilities and is a short distance from the apartment. The closest beaches are only 1.5 miles from the apartment with the nearest town of Estepona 6 miles in the opposite direction to Puerto Banus being more tranquil and with a more Spanish feel. If you would like to be pampered, the Spa facilities at the 5 star Ritz Carlton Hotel Villa Padierna are luxurious. Also, a short distance away is the POSH salon (as featured on Marbella Belles screened on ITV). They offer an extensive range of beauty treatments, PowerPlate and much more. Mid stay cleans can be arranged at an extra cost. Please contact owner for details.